Be the first to share your favorite memory, photo or story of Rita . This memorial page is dedicated for family, friends and future generations to celebrate the life of their loved one. Rita Benshoof-Darner, 86, of the Madrid Home in Madrid, and formerly of Boone, passed away on Saturday, November 17, 2018 at the Boone County Hospital. Per her wishes, Rita has been cremated. A Memorial Service will be held on Saturday, November 24, 2018 at 10:30 am, in the Chapel of the Madrid Home, 613 W. North St., with Pastor Marshall Felderman officiating. There will be a one hour visitation before the service at the home. Burial of her cremains will be held at a later date in the Mineral Ridge Cemetery in Ridgeport. Rita Joann (Land) Benshoof-Darner was born in Boone, Iowa on April 19th, 1932, the daughter of Hosea and Hazel (Harris) Land. She attended school at Boone High School. Rita married Bill Benshoof in Omaha, NE on October 14, 1949. They spent many years living in California and moved back to Boone in the early 1970’s. 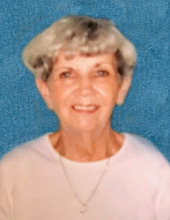 Rita was a homemaker and enjoyed spending time with friends and family, watching crime dramas, and following the Kennedy family. She spent the last five years making new friends and reconnecting with old ones at the Madrid Home while playing bingo and attending church. Paul Land, her sisters, Wanda DeMartini and Arlie Taylor, and two infant brothers. She is survived by children, Brenda (Michael) Johnson of West Des Moines, and Bill (Kim) Benshoof of Boone; four grandchildren, Charles Johnson, Robyn Branch, Breck (Brian) Hart, and Blaire Benshoof; six great-grandchildren; four siblings, Mae Dannett of Boone, Ruby Riley of Muritta, CA, Janet Land of Wheat Ridge, CO, and Larry (Linda) Land of Fort Myers, FL. To send flowers or a remembrance gift to the family of Rita Benshoof-Darner, please visit our Tribute Store. "Email Address" would like to share the life celebration of Rita Benshoof-Darner. Click on the "link" to go to share a favorite memory or leave a condolence message for the family.